Happy Thursday! This week our spotlight weekly theme is neon! I love brights, especially in the warmer months! Come share your neon looks with Elle and I! This week Elle and I are using the hashtag #spotlightweekly on on twitter/instagram posts to share all of our looks! Please feel to use this to share your looks! We cannot wait to see how you style your looks! 1. We kindly ask that you follow the two hosts: Elle from Living in Color Style and Jacqueline from Stylin' In St. Louis via Bloglovin or GFC, and of course, our co-host Erin of The Fashion Canvas blog. Spotlight: Our spotlight this week is Hillary of Style in a Small Town. Hillary looks fabulous in this striped skirt! Such a great item to have in your wardrobe. She used the hashtag #spotlightweekly to show he look and we could not be more thrilled. Check out her adorable blog! Nextweek: Next week our spotlight weekly theme is SUMMER HATS! Thanks for linking up! See you next week! 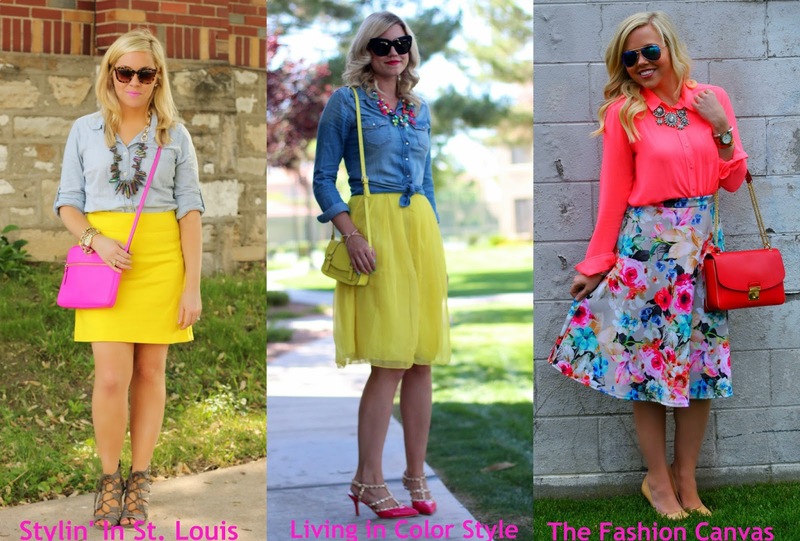 Love these bright looks! Perfect for summer! The bright yellow skirt is perfect for summer! Love this look! Love all of these looks! Your yellow skirt is gorgeous! Great link up! Love that skirt and that bag! I love those lace ups and I really want them in this color and the black. They are so versitile! Looking pretty lady! What a perfect theme for summer! The yellow skirt with the bright pink bag nailed the entire look together! The yellow just goes so well with the fun pink purse. Love those shoes! Loving the neon + that amazing stone necklace, babe. You look awesome! one of my summer style goals is to wear more bright colors! :) love the color of your skirt and bag. The yellow and pink is such a fun color combination! Those lace up heels are to die for! You look gorgeous in yellow pretty lady! I love that neon is so in for the summer! Love your outfit and you look gorgeous! Jac, that Neon Yellow Skirt is FAB!! You and Elle both wore Skirts in almost identical colors. I also love the neon pink bag and gorgeous toenails that match. Have a Fab Weekend, Pretty Lady!! I LOVE that neon skirt. Really cute! Neon is definitely a trend I'd like to see stick around. Thanks for hosting! You definitely nailed the neon trend! :) Love this outfit! I love how you paired the yellow and pink, it looks gorgeous! Your necklace is amazing as well! So adorable! That yellow skirt is fabulous, and I love that pink bag! This skirt is so gorgeous on you girl! Love the entire look! The yellow skirt is so amazing!! !